It may be a comic book sin, but one of my most watched DVD's is the last Ghost Rider movie. I hate the jelly beans, Karen Carpenter, and plot holes so big even Johnny can't jump them, but seeing the Rider in 'real life' after being a fan for so long more than makes up for it. 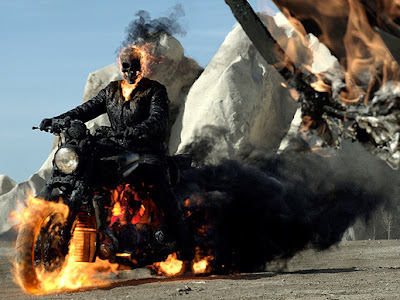 Now Empire Magazine, the hottest source on all the biggest features has the first look at Johnny Blaze from the Ghost Rider: Spirit of Vengeance - and what do you know? He's even more realistic now. Small tweaks like covering the Rider and his ride in what looks like charcoal emphasises the heat of hell-fire. Having his tires and flame encrusted head give off plumes of smoke ensures Blaze is a truly terrifying sight for those who know they are about to burn. See more photos from the crew at Empire, right after the jump. I'll admit, I'm really digging the new Ghost Rider pics, but I really still can't get over who plays GH; namely Nicholas Cage. I just personally can't stand the guy, even though I enjoyed him in Family Man. They should've cast a more younger guy to play Johnny Blaze, like maybe Paul Walker or somebody. So in short, no I didn't really care for the GH movie, but Eva mendes was smoking hot as usual though. I'm in the same boat with you re: Mr Cage Dale, I too picture Johnny a lot younger (Paul Walker is a great choice! ).